Choo Choo! 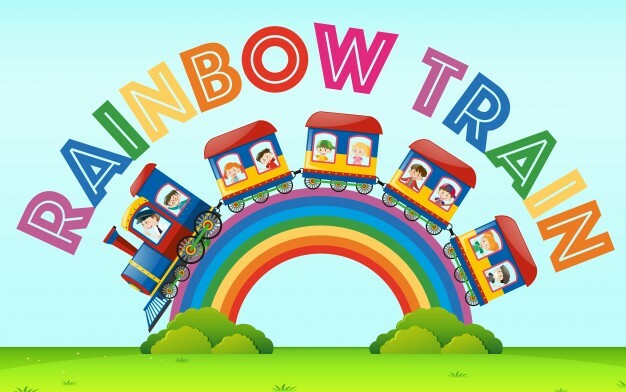 Join us for RainbowTrain Tour this October! – Visit Zenxin Organic Park, the largest organic park in Johor and the first open-to-public organic farm in Malaysia. – Visit UK Agro Park, the largest goat farm in Johor, herb garden, Jakun village (with tree house), Mushroom farm. – Overnight stay at “Rao-di-fang” Homestay, one of the famous homestay in the city. Choice of 2-bed and 4-bed rooms. – Visit famous 50 years old “Sultan Coffee” factory and 70 years old “Nam Yick” biscuit shop. – 6-Course dinner on the 1st day. Secure your train seat now and join us for the fun! Sign up via whatsapp to Andrew at 9011 3220 latest by 23 Aug, Wednesday. MOVE Community is a LGBT friendly social & community club in Singapore formed in 2013. By joining any event organized by MOVE Community, you agree that MOVE Community will not be responsible for any injury or discomfort that happens to you during the event, whether physically or mentally. You will also agree that you will take responsibility to resolve any conflict you have with other participant(s) by yourself. On the other hand, please respect the privacy of others and treat others like you want to be treated. Do you know there is a Lighthouse at Fort Canning Park? Do you know Sir Stamford Raffles developed the 1st “Botanical and Experimental Garden” at Fort Canning, the very site the Spice Garden sits? Join us as we uncover the rich history of this place & learn about the origin of various spices we use or savour in our daily meals. We will proceed to have dinner together after the walk. To sign up for this trail, please email to justinchew46@gmail.com or myevent.move@gmail.com. You may also whatsapp to 9011 3220 for sign up or enquiries. 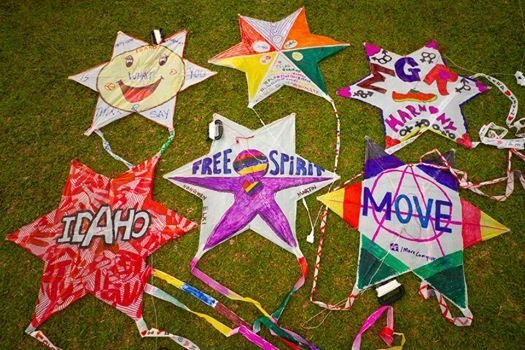 MOVE Community presents a kite-flying event in May! Join us for a second round of kite flying in honour of IDAHO (17 May). This is an all-inclusive activity. Everyone is welcome. Share, invite your friends and loved ones to join and celebrate together with us. Not sure of the first event in 2014? Check out this event URL! We will meet at Marina Barrage at 2.15PM. Please be at the entrance to Marina Barrage (which has a sign showing in big, “MARINA BARRAGE”). Marina Barrage is accessible by bus or train. You may access it via Bayfront station on the Circle/Downtown line with a 21 minute walk, or simply take bus 400 from Marina Bay station on the North-South/Circle line. Bring yourself definitely. And we will have a potluck so please bring any foodstuff as well. If you don’t have a kite, that is fine too. If you have attended the event in 2014, please come in the tee shirt you have worn then! In the case of wet weather, we can attend the Kristang Language Festival nearby at the Civic District! By joining any event organized by MOVE Community, you agree that MOVE Community is not responsible for any injury or discomfort happen to you during the event, whether physically or mentally. You will also agree that you will take responsible to resolve any conflict you have with other participant(s) by yourself. On the other hand, please respect other participant’s privacy and treat other like you want to be treated. Club 40+ is a new initiative of MOVE Community designed for gay men 40 years’ old & above. The programme sets to identify and address needs; provides mutual support and helps to improve lives of older gay adults. Sinner, saint, devil or divine!? 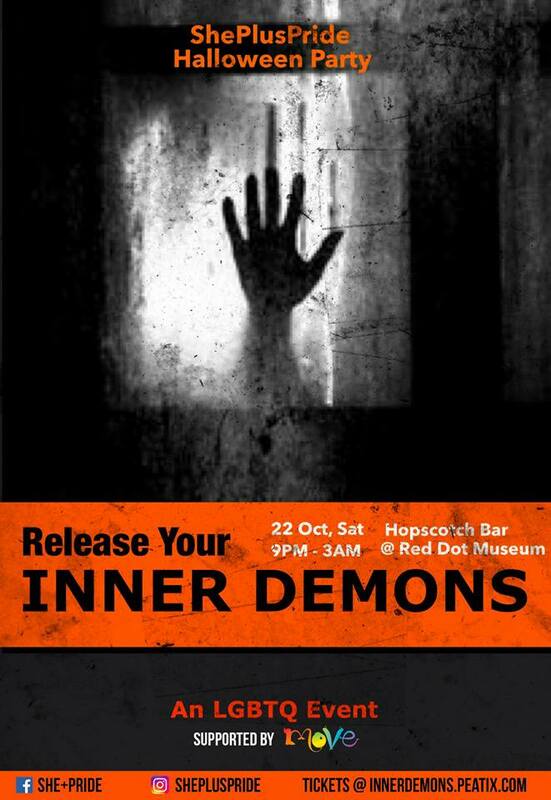 Unleash your inner demons at our Halloween Party.